Building upon Bryan Hitch's designs and the cover to The Ultimates #2, this Marvel Select masterpiece (sculpted by Steve Kiwus) depicts Ultimate Iron Man in his full armor, complete with the rack system Tony Stark uses to put on the high-tech battlesuit. 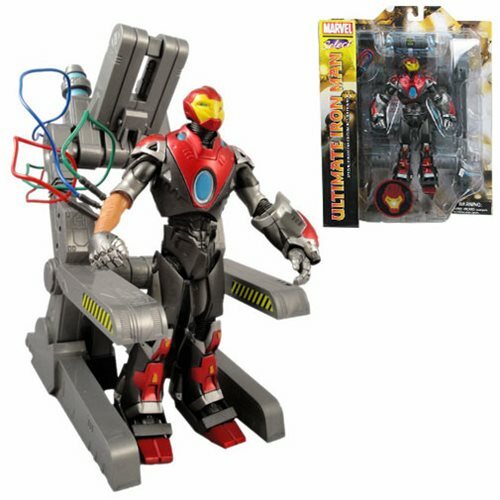 Standing 7-inches tall and featuring several points of articulation, Ultimate Iron Man features removable armor on his arms and wires to interface his arms with the machine as depicted on the cover. Blister card packaging. Ages 8 and up.